ACCESS : Access to the Montels is by a small lane which ends in a cul de sac at the villa. No other vehicles use this lane, so this gives privacy to the villa and offers peace and quiet. The only sound tourists can hear is the singing of the cicadas in the heat of a summer’s afternoon. The property is not over-looked, the nearest house is a few kms away. 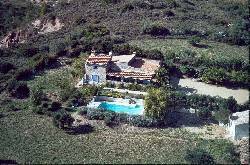 THE LAND : The house is in the middle of a huge garden of 9,000 m2, all of which is totally enclosed. It is well stocked with a wide variety of trees and Mediterranean plants: olive trees, almond trees, different fruits trees, and different“herbes de Provence” growing between the rocks. There is a large parking area sufficient for 10 or more vehicles next to the villa. THE POOL : There is a large 10m x 5m pool which has been entirely renovated.It is between 1 and 2 metres deep and is equipped with certified safety alarm thatcan detect someone falling in the water. The water temperature varies between25 to 30°C throughout the summer. THE VILLA : The villa has a total living area of 160 m2. 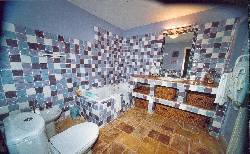 It was completely renovatedin 2004 - repainted, re-decorated and new floors fitted. There are new furnishings,new linen and the decorations are fresh, with gay and clear colours.A very light and airy veranda, which opens onto the pool and has views over the surrounding countryside.A bedroom with a double bed (160 cm x 200 cm) and a bathroom with WC.A bedroom with 2 single beds (90 cm x 190cm), which can be put together to makeone single large bed.A bedroom with 2 bunk beds (90 cm x 190cm), plus 2 additional mattresses, so 4persons could sleep here comfortably (even 6 people if needed).A shower room with WC.An independent toilet (there are 3 in the whole villa).A fully fitted kithchen.A large combined living room and dining room.A terrace, close to the dining room, with a BBQ.A mezzanine area with a television set and a sofa which could be used as anextra-bed if needed.The villa can take up to 8 people who can then live comfortably, but 10 peopleis also possible. THE FITTINGS Kitchen American style, large refrigerator Micro-wave oven Cooker with integrated ovenToaster, kettle, coffee-maker Dish washer .The necessary crockery and place settings for 10 people.Complete and matched table linenA high-chairBedrooms and bathrooms.Two matched sheets for every bed.Several towels per person. A cot for a baby, and a foldaway safety barrier for a double bed.Living room and mezzanine.BROADBAND INTERNET acces, wireless or not. Hi-fi system with CD playerTelevision set, DVD player, satellite TV.A fireplace for the winter time.Utility room.Washing machine.Drying cabinet.Ironing board and electric ironVacuum cleaner.Several fans for the really hot days. Mountain bikes and bicycle baby chairs are available for guests.Central heating for winter rentals, the house is very warm.